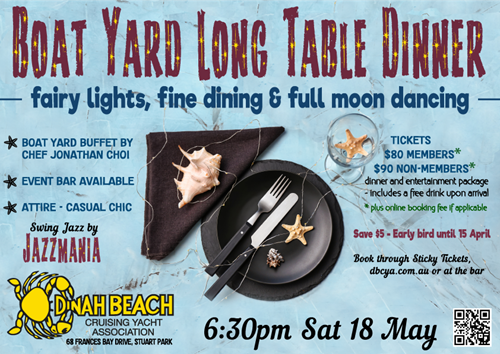 DInah Beach Cruising Yacht Association announces its first Boat Yard Long Table Dinner - come dressed in casual chic for a grand night of fairy lights, fine dining & full moon dancing. Set in the re-imagined Club Boat Yard, this very social dinner event includes a sumptuous buffet dinner by Chef Jonathan Choi and brilliant live swing jazz by Darwin's own Jazzmania. Ticket price includes dinner and entertainment package plus a free standard drink from the Boat Yard Bar upon arrival. Boat Yard bar facility plus the full clubhouse bar available on the night. Discounted sponsor drinks will be on offer. Drop the kids off at Bass in the Grass and treat yourself to a uniquely special night. Non-members - consider first purchasing a pro-rata social membership at the DBCYA Clubhouse bar for only $12.50 (valid until 30 June 2019) and get a $10 discount off your ticket price! Members receive typically a $1 discount off drinks and lots more cool perks throughout the year.